USES: This medication is used to treat the symptoms of a prostate gland condition called BPH (benign prostatic hyperplasia, also known as enlarged prostate). It is an alpha blocker that works by relaxing the muscles in the bladder neck and prostate. Relaxing these muscles leads to relief of symptoms of BPH such as the feeling of needing to urinate frequently or urgently, difficulty in beginning the flow of urine, weak stream, and the need to urinate during the middle of the night. This medication should not be used to treat high blood pressure. OTHER USES: This section contains uses of this drug that are not listed in the approved professional labeling for the drug but that may be prescribed by your health care professional. Use this drug for a condition that is listed in this section only if it has been so prescribed by your health care professional. Alfuzosin may also be used to help your body "pass," or get rid of, kidney stones through urination. HOW TO USE: Read the Patient Information Leaflet provided by your pharmacist before you start using alfuzosin and each time you get a refill. If you have any questions, consult your doctor or pharmacist. Take this medication by mouth once daily after a meal or as directed by your doctor. This medication works best when taken with food. Taking alfuzosin on an empty stomach may decrease the absorption of this drug and reduce its effectiveness. Do not crush or chew extended-release tablets. Doing so can release all of the drug at once, increasing the risk of side effects. Also, do not split the tablets unless they have a score line and your doctor or pharmacist tells you to do so. Swallow the whole or split tablet without crushing or chewing. This medication may cause dizziness and lightheadedness. To avoid injuries such as falls, take your first dose of alfuzosin with food at bedtime until your body adjusts to the effect of the medicine. Also, anytime the dosage of this drug is changed, take your first new dose with food at bedtime. Avoid eating grapefruit or drinking grapefruit juice while being treated with this medication unless your doctor instructs you otherwise. Grapefruit juice can increase the amount of certain medications in your bloodstream. Consult your doctor or pharmacist for more details. Use this medication regularly in order to get the most benefit from it. Remember to take it after the same meal each day. Inform your doctor if your condition persists or worsens. SIDE EFFECTS: Dizziness/lightheadedness, headache, or decreased sexual ability may occur. If any of these effects persist or worsen, tell your doctor or pharmacist promptly. Remember that your doctor has prescribed this medication because he or she has judged that the benefit to you is greater than the risk of side effects. Many people using this medication do not have serious side effects. Tell your doctor immediately if any of these unlikely but serious side effects occur: unusual tiredness/weakness, severe stomach/abdominal pain, yellowing eyes/skin, persistent nausea/vomiting, dark urine. Seek immediate medical attention if any of these rare but very serious side effects occur: severe dizziness, fainting, fast/irregular heartbeat, chest pain. For males, in the very unlikely event you have a painful or prolonged erection lasting 4 or more hours, stop using this drug and seek immediate medical attention, or permanent problems could occur. A very serious allergic reaction to this drug is rare. However, seek immediate medical attention if you notice any symptoms of a serious allergic reaction, including: rash, itching/swelling (especially of the face/tongue/throat), severe dizziness, trouble breathing. This is not a complete list of possible side effects. If you notice other effects not listed above, contact your doctor or pharmacist. In the US - Call your doctor for medical advice about side effects. You may report side effects to FDA at 1-800-FDA-1088. In Canada - Call your doctor for medical advice about side effects. You may report side effects to Health Canada at 1-866-234-2345. PRECAUTIONS: Before taking alfuzosin, tell your doctor or pharmacist if you are allergic to it; or to other alpha blockers such as doxazosin, prazosin, terazosin; or if you have any other allergies. This product may contain inactive ingredients, which can cause allergic reactions or other problems. Talk to your pharmacist for more details. This medication should not be used if you have certain medical conditions. Before using this medicine, consult your doctor or pharmacist if you have: liver problems. Before using this medication, tell your doctor or pharmacist your medical history, especially of: other prostate gland problems (e.g., prostate cancer), heart problems (e.g., angina, low blood pressure), kidney disease. Alfuzosin may cause a condition that affects the heart rhythm (QT prolongation). QT prolongation can infrequently result in serious (rarely fatal) fast/irregular heartbeat and other symptoms (such as severe dizziness, fainting) that require immediate medical attention. The risk of QT prolongation may be increased if you have certain medical conditions or are taking other drugs that may affect the heart rhythm (see also Drug Interactions section). 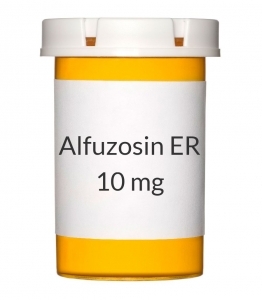 Before using alfuzosin, tell your doctor or pharmacist if you have any of the following conditions: certain heart problems (heart failure, slow heartbeat, QT prolongation in the EKG), family history of certain heart problems (QT prolongation in the EKG, sudden cardiac death). Low levels of potassium or magnesium in the blood may also increase your risk of QT prolongation. This risk may increase if you use certain drugs (such as diuretics/"water pills") or if you have conditions such as severe sweating, diarrhea, or vomiting. Talk to your doctor about using alfuzosin safely. This drug may make you dizzy. Do not drive, use machinery, or do any activity that requires alertness until you are sure you can perform such activities safely. Limit alcoholic beverages. To minimize dizziness and lightheadedness, get up slowly when rising from a sitting or lying position, especially when you first start taking this drug or if your doctor changes your dose. Also, when you first start taking this drug, avoid situations where you may be injured if you faint. Before having surgery (including cataract eye surgery), tell your doctor or dentist that you are taking this medication. Kidney function declines as you grow older. This medication is removed by the kidneys. Therefore, elderly people may be at a greater risk for dizziness while using this drug. During pregnancy, alfuzosin should be used only when clearly needed. Discuss the risks and benefits with your doctor. It is unknown if this medication passes into breast milk. Consult your doctor before breast-feeding. DRUG INTERACTIONS: See also How to Use section. Drug interactions may change how your medications work or increase your risk for serious side effects. This document does not contain all possible drug interactions. Keep a list of all the products you use (including prescription/nonprescription drugs and herbal products) and share it with your doctor and pharmacist. Do not start, stop, or change the dosage of any medicines without your doctor's approval. Some products that may interact with this drug include: drugs to treat erectile dysfunction-ED or pulmonary hypertension (such as sildenafil, tadalafil, vardenafil), other medications that lower blood pressure (e.g., atenolol, diltiazem). If you are also taking sildenafil and your dose is more than 25 milligrams, you can reduce your risk of fainting by taking your doses of sildenafil and alfuzosin more than 4 hours apart. Consult your doctor or pharmacist if you have any questions. Other medications can affect the removal of alfuzosin from your body, which may affect how alfuzosin works. Examples include azole antifungals (such as itraconazole, ketoconazole), boceprevir, macrolide antibiotics (such as clarithromycin), nefazodone, HIV protease inhibitors (such as lopinavir, ritonavir), telaprevir, telithromycin, among others. Many drugs besides alfuzosin may affect the heart rhythm (QT prolongation), including amiodarone, dofetilide, pimozide, procainamide, quinidine, sotalol, macrolide antibiotics (such as erythromycin), among others. Therefore, before using alfuzosin, report all medications you are currently using to your doctor or pharmacist. OVERDOSE: If overdose is suspected, contact your local poison control center or emergency room immediately. US residents should call the US National Poison Hotline at 1-800-222-1222. Canada residents should call a provincial poison control center. Symptoms of overdose may include: fainting, irregular heartbeat. NOTES: Do not share this medication with others. Laboratory and/or medical tests (e.g., prostate exams, prostate-specific antigen or PSA) should be performed periodically to monitor your progress or check for side effects. Consult your doctor for more details.